One of the most enduring and best-documented behavioral biases in investing is called “The Home Country Bias.” Despite the availability of well-regarded and highly profitable corporations located throughout the world, investors tend to limit their investments to those companies domiciled in their own country. At one time, a survey of institutional investors in France found that 97% of their equity investments consisted of French companies despite the fact that France represented only 3% of the world’s total equity capitalization. Such a bias is found all over the world. British investors prefer British companies, Japanese investors prefer Japanese companies, and U.S. investors prefer companies domiciled in the United States. Despite the substantial risk-reducing benefits of international diversification, investors all over the world exhibit a home country bias. In addition to the risk-reducing benefits of broad diversification, investing outside one’s home country is consistent with the basic rationale of index investing. In any national market, active portfolio management (involving the purchase of a subset of stocks believed to offer above-average returns) must be a zero-sum game. Since all the stocks in any market must be held by someone, the gains and losses from active management must balance out. If some investors are holding those stocks that produce above-average returns, it must follow that other investors must be holding the stocks that provide below-average returns. We can’t all be above average. The argument can be extended to world markets. If some active managers are holding only the stocks in national stock markets that outperform the world average, it must follow that other investors are holding stocks in the various country markets that have underperformed. The global index investor who holds a portfolio that consists of all the stocks in the world (by holding a world index fund or all the components of the world markets) must therefore outperform the average active manager who holds only a subset of the world’s equity securities. If we are to come to some reasonable judgment regarding the appropriate exposure of an investment portfolio to emerging markets, it is important to understand their size and importance to the world economy. The table below presents the total market capitalization of the various regions of the world in millions of dollars. Note that the United States represents only 36.2% of the world’s market capitalization. EMs represent 24.6%. Thus, if an investor wished to hold a world portfolio weighted by market capitalization, almost one quarter of that portfolio would consist of EM equities. *Figures are not float adjusted and Korea is considered an emerging market consistent with MSCI indexes. Excluding so-called “control holdings” emerging markets represent 17% of the total (Control holdings do not trade in the market; an example of this would be a government that holds 50% of a company’s stock to maintain control of it, these shares will not trade freely and will not be available to investors). Another metric that might be used to judge the appropriateness of an emerging markets equity allocation is to examine the share of world gross domestic product represented by these markets. Inter-country comparisons can be tricky requiring exchange rate and purchasing power parity adjustments. In one estimate, made by the International Monetary Fund, emerging markets have already exceeded the GDP of the developed market countries, as is shown in Figure 2 below. 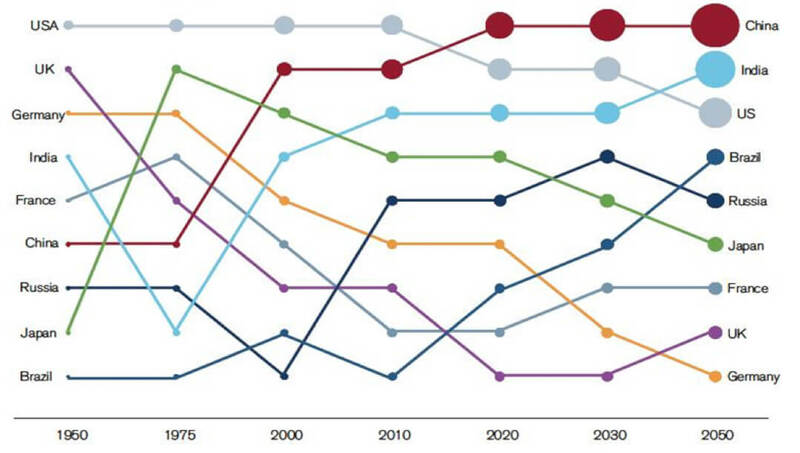 Emerging and developing economies’ share of world Gross Domestic Product (GDP) have exceeded that of advanced economies starting in 2013 (percent of world GDP, based on purchasing power parity). While there is no single measure of the size of emerging markets to guide the appropriate weighting of these markets in globally diversified portfolios, the discussion above suggests a range of possible parameters. Emerging markets represent about 25% of the world’s equity market capitalization. Float-adjusted, these markets represent over 17% of the world total (float adjustment removes so called ‘control’ holdings that do not trade in the market. For example, if a government holds 50% of a company’s stock to maintain control of it, these shares will not trade freely and will not be available to investors). Investing in emerging-market equities does involve additional risk. Equity markets in developing countries are extremely volatile. Moreover, some emerging markets have relatively unstable governments. Foreign investing for U.S. nationals also involves the assumption of currency risk (or the need to engage in potentially expensive currency hedging). Risk mitigation would indicate a smaller share of one’s investment portfolio should be devoted to emerging markets than the previous discussion would suggest. Of course, portfolio considerations can cut the other way. 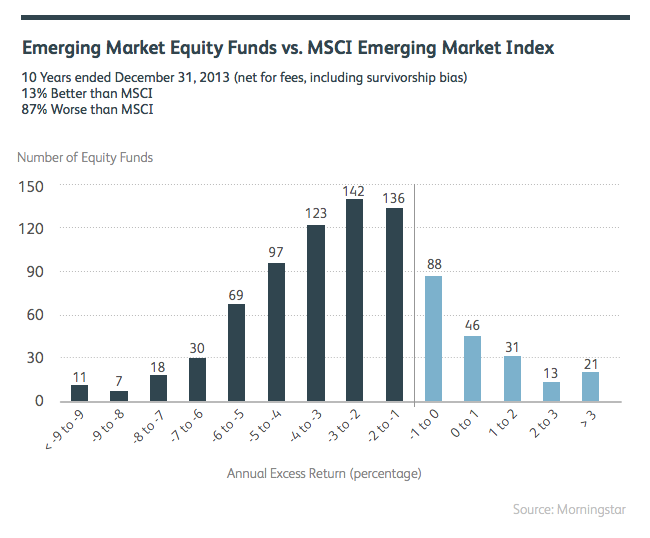 As long as the correlations of the other asset classes with EM equities are moderate, adding volatile EM equities to a globally-diversified portfolio can, in some circumstances, actually decrease portfolio risk. 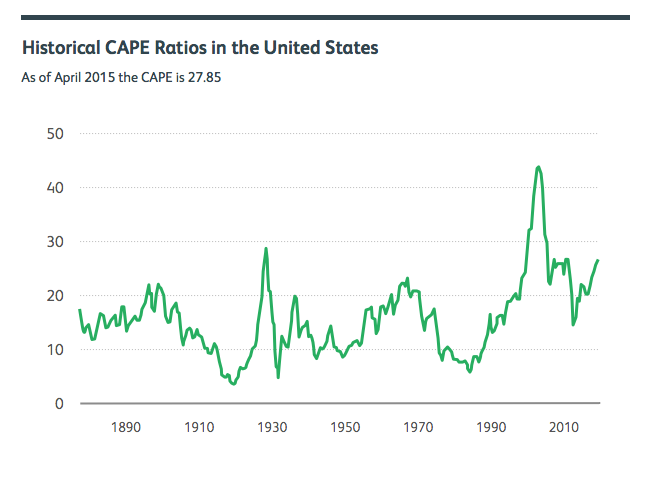 One of the best predictors of equity returns over the long run is the cyclically adjusted P/E ratio or CAPE ratio. It measures the current price of a broad stock-market index divided by the average earnings of the component companies over the past 10 years. The CAPE ratio is not a reliable predictor of returns one or two years in the future, but it does provide a useful (though not perfect) forecast of returns 10 years in the future. Figure 6 presents the U.S. data starting in 1926. When stocks had CAPEs of 10½ or less, the U.S. stock market produced 10-year returns of over 16%. But when CAPEs were over 25, returns tended to be far more modest, averaging under 4%. Source: WaveFront Capital and author’s calculations. Unlike the situation in the United States, EMs have been relatively unpopular and valuations are extremely modest. Figure 9 shows that EM CAPEs are between 10 and 15. They have been far higher in the past. At today’s levels, they suggest relatively attractive returns over the longer run. The relative valuations in world financial markets suggest that a substantial allocation to EM equities can be justified, despite their greater risk. Emerging markets represent a substantial share of the total capitalization of world equity markets. While risky, these stock markets have relatively attractive valuations. At Wealthfront we have allocated between 5% and 28% of our portfolios to emerging market equities for investors who are able to tolerate some risk and who have long enough investment horizons to ride out the inevitable ups and downs of these markets. While our allocations tend to be higher than those recommended by many investment advisors, we believe that a home country bias has led to their underrepresentation in most globally diversified investment portfolios. And our allocations are far closer to the relative size of these markets in globally diversified capital markets. Certainly a market-capitalization weighted global portfolio would be a reasonable choice for an investor with average risk tolerance. Younger investors with long investment horizons and higher risk tolerances would find that portfolios farther out the return/risk spectrum would be appropriate.